The avalanche danger remains LOW at all elevations in the forecast zone where triggering an avalanche will be unlikely. 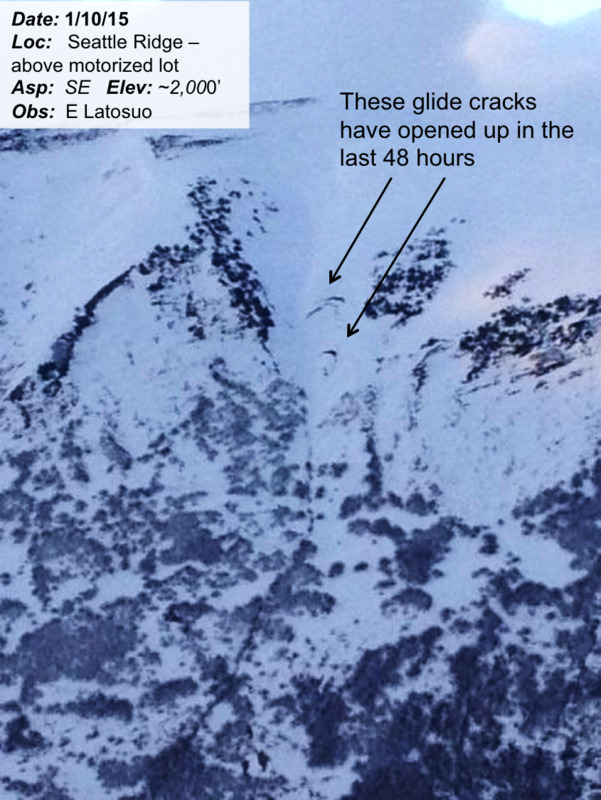 However, naturally occurring glide avalanches are possible as glide cracks have been opening recently. It is key to recognize and avoid being under these cracks (photos below). In steep terrain above 4,000' where dry snow exists, pockets of unstable snow may be found - most likely in the form of stiff wind slabs. Once again, the main hazard in the backcountry will be negotiating hard and slick snow surface conditions along with rocks, stumps, overflow ice, etc. I think the word is out that Turnagain Pass is not the place to find powder snow - this weekend anyhow... After a very warm storm rolled through Thursday saturating much of the snowpack up to 2,500' and the surface layers up to 3,500', the pack is slowly freezing from the top down. The rain wiped out much of the snow below 1,500' and hiking is required from the parking lots at the Pass. Above 1,500', the snowpack does get deeper quickly, but it's the surface conditions that are the challenge. In short, the surface crust is mostly supportable, hard and slick. Beware that steep slopes have a slide-for-life character. Where the crust ends and the soft snow begins is likely around 4,000'. If you are headed to these high elevations, assessing the snowpack is key. Keep your eye out for weak snow, such as buried surface hoar or facets, sitting under stiffer slabs. Finding a slab avalanche, most likely a wind slab, in these more remote and high elevations is possible. For more details on snowpack and surface conditions, check out the several observations sent in yesterday from a level 2 avalanche course in the neighborhood. Thanks Alaska Avalanche School! Many glide cracks continue to open up in the forecast zone. During the day yesterday several new cracks were seen opening as well as existing cracks widen. None were reported to have avalanched but one avalanche instructor commented "We would not want to be below these glide cracks right now!". That said, these are easy to recognize and avoidance is the best tactic considering their unpredictable nature and destructive potential. This is not the kind of avalanche a person can trigger, rather would be a case of being in the wrong place at the wrong time. Photo below is of three "brown frowns" that have opened in the pat 48-hours (Eeva Latosuo). Yesterday was a mild day in the backcountry with partly cloudy skies, light Easterly winds and temperatures in the mid 30's F at the mid elevations and low 30's on the ridgetops. There has been no precipitation since Thursday's 0.5-1" of rain up to 3,000'. Another mild day is in store for today. We should see partly cloudy skies with a slight bump in the Easterly ridgetop winds, into the 15mph zone. Temperatures look to remain near 30F on the ridgetops and the mid 30's F at the mid and lower elevations. Our next shot for precipitation is expected to arrive tomorrow afternoon in the form of rain below 2,500' or so. This system will again usher in warm and windy conditions with moderate precipitation amounts. Stay tuned. Looking further into the crystal ball (weather models) for later in the week and into the weekend, we will see a series of low pressure systems in the Gulf move through with showery precipitation. Slightly cooler temperatures are expected for Friday, which will help to lower the rain/snow line. However, warmer air looks to follow right behind for Saturday into Sunday, keeping the rain/snow line in the 2,000' zone.